Captivating five stone diamond signet ring featuring a dazzling show of round brilliant cut diamonds within a beautifully crafted modern signet ring design. The Honesty Diamond signet ring features elegant styling, combined with a dazzling array of 5 Round Brilliant cut Diamonds. Each Diamond measures 2mm, skilfully grain set within a solid band of precious metal. 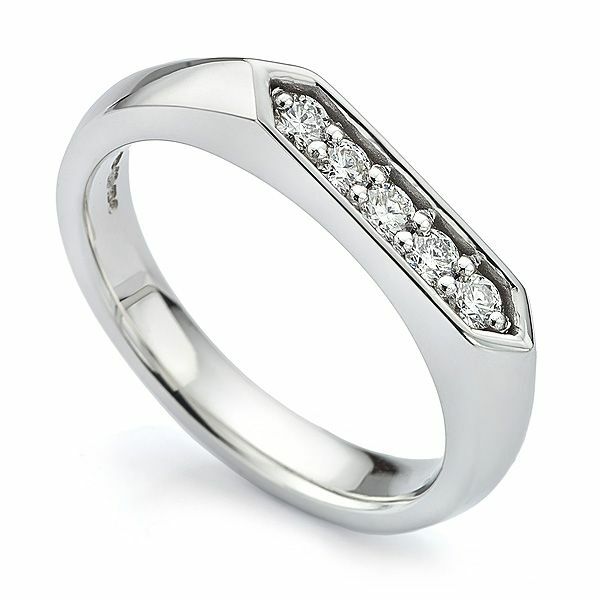 The Honesty signet ring measures 3.5mm in width across the Diamond face, set with 0.15cts of total Diamond weight. Each Diamond is selected to achieve F Colour whiteness, combined with VS1 Clarity, cut for increased brilliance. The ring design benefits from a 3mm comfort fit court profile band which flows harmoniously towards sculptured knife-edged shoulders. This design is crafted to order in a wide choice of responsibly sourced precious metals. Created under the care of British craftsmanship, this elegant signet ring can be made in Fairtrade Gold. Your completed ring commission will be delightfully packaged and hand delivered by secure courier to your door. Please contact us if you require any additional advice or guidance.